A prenuptial agreement is a contract between husband and wife before marriage for the decisions about what will happen to the assets of the couple after an unfortunate incident like divorce, separation or death. 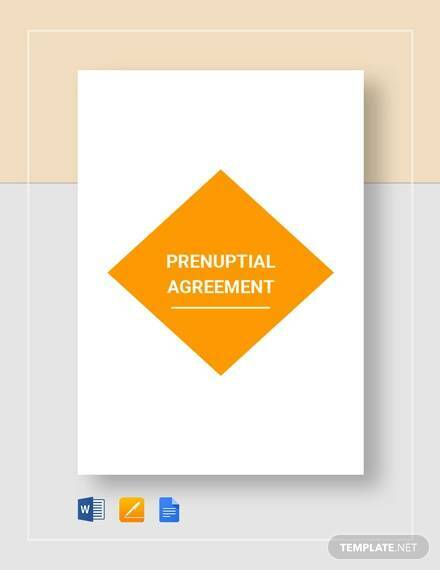 Prenuptial agreement sample is gaining popularity today because of the increasing divorce rates. For avoiding the lawsuit cases in court, couples enter into a prenuptial agreement for the division of assets and properties. 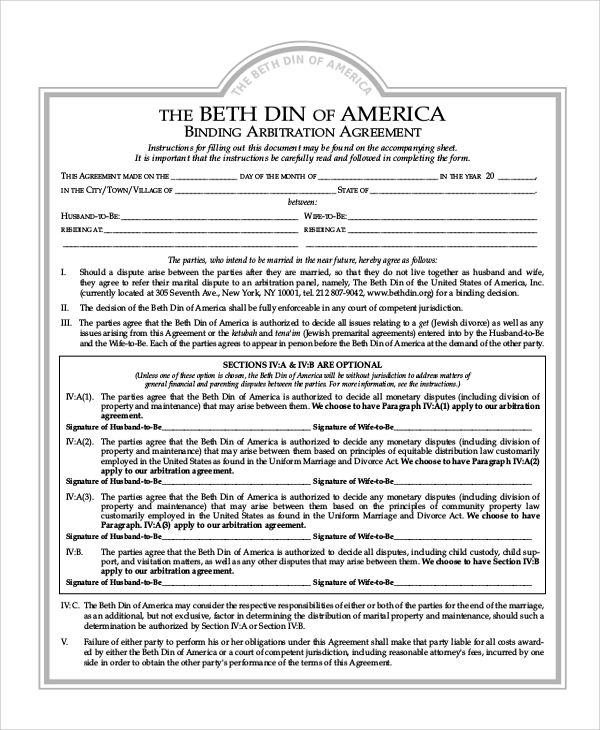 Listed below are some Sample Agreements for reference and details. 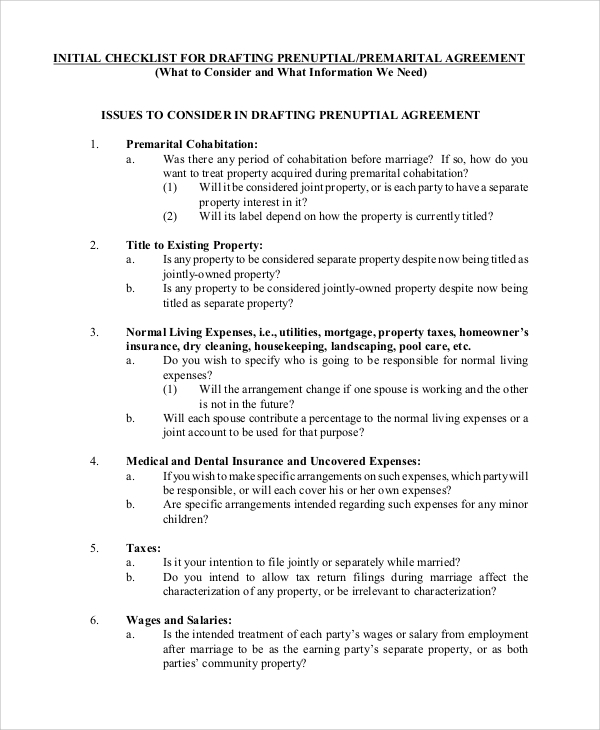 This prenuptial agreement sample includes the name of both the parties and tabular detailing of his and her properties like bank accounts, real estate, etc. 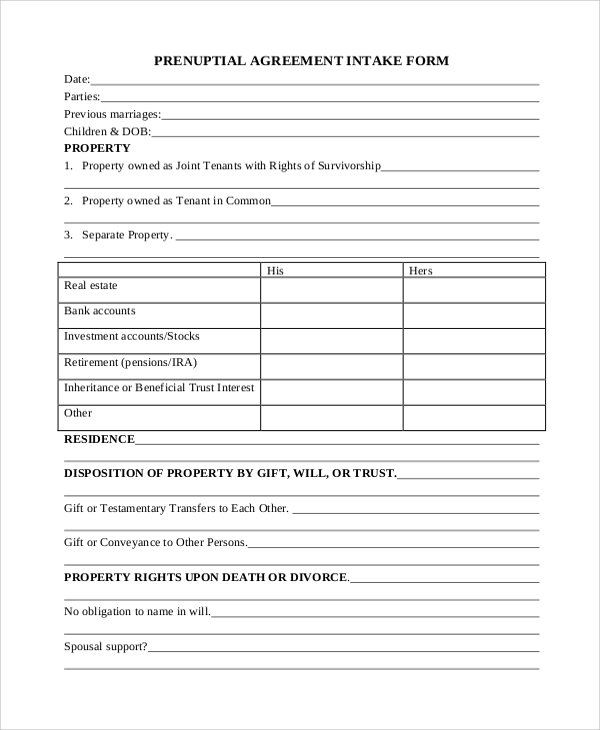 Gift transfers are also listed, and the decision for property rights after spouse’s death is written. It is an extensively detailed document with a record of all the assets and liabilities of both the parties. It also has a section recording net income. 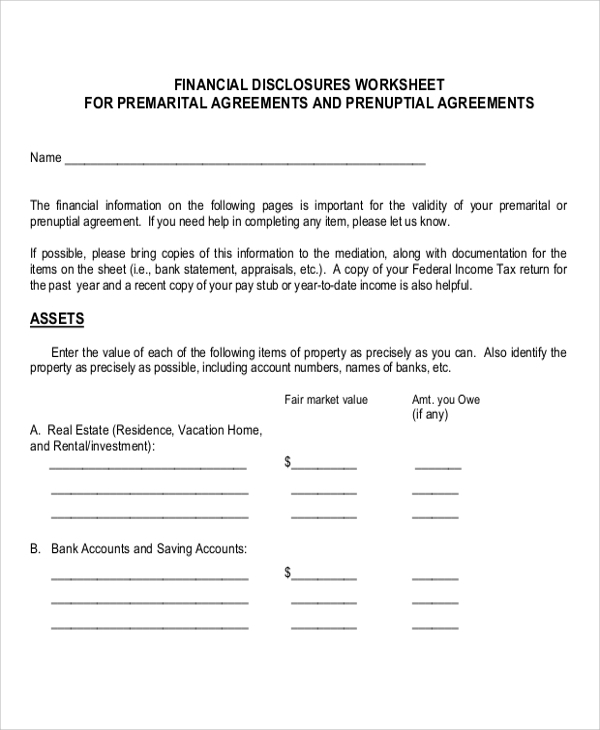 This prenuptial agreement sample records last year’s and this year’s incomes and deductions. This agreement mentions covenants in several sections and headings. If the marriage ends in separation, there would be no acknowledgment of claim by any parties. Many decisions about the effect on children, taxes and financial disclosures, etc. are enlisted in this prenuptial agreement sample. What are the uses of Prenuptial Agreement Samples? A Prenuptial Agreement is a legal document to ensure a smooth determination and distribution of assets and property in case of events like divorce or death. It is a very useful document and helps in avoiding legal cases or legal battles over the property after the separation of couples. It has proven to be great use in recent times. Therefore, this concept is gaining popularity these days. 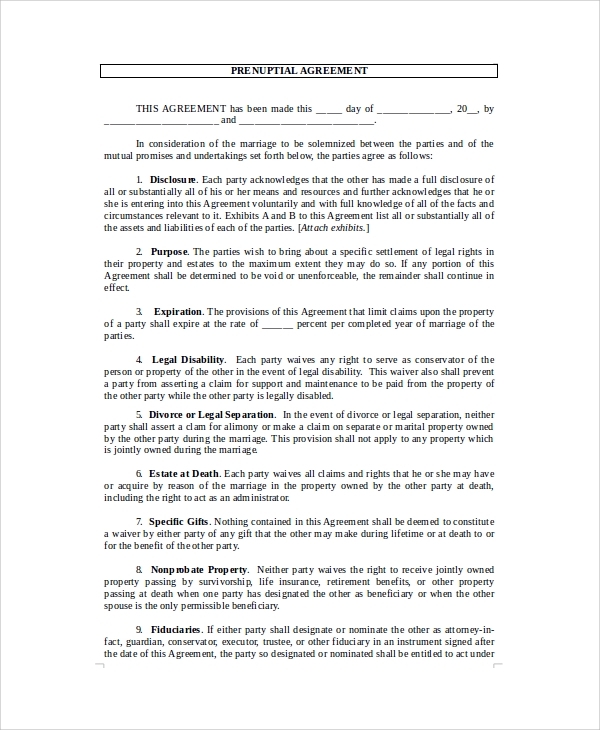 Free prenuptial agreement template can be downloaded from the web for making better use of the contract. It has become an essential choice today because of the ever increasing rates of divorces and separation. Starting with the name and signature of both the parties, this agreement goes on to enlist all the conditions upon which the agreement is set. In the last, there is a section for the signature of the witnesses and legal authorities. 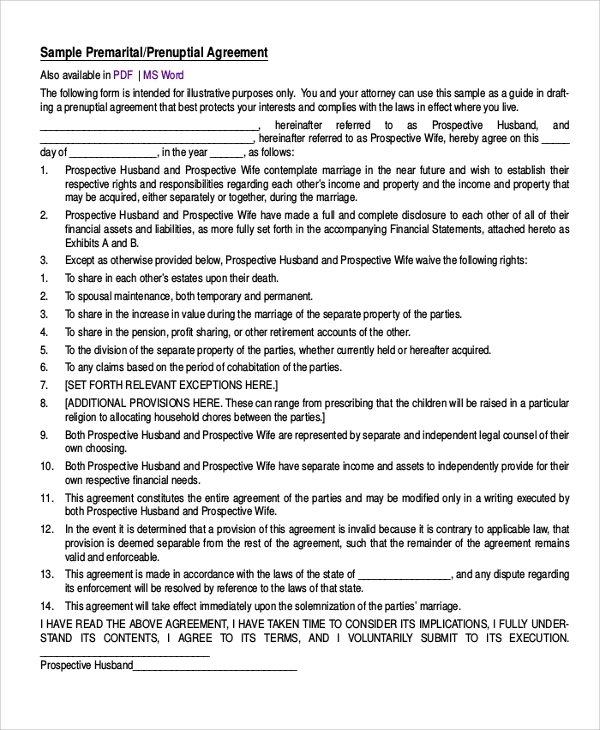 The main purpose of this Prenuptial Agreement Sample is to serve as a decision maker if the married couple ends in divorce or separation. It records all the conditions which are to adhere after the divorce strictly. What are the Benefits and Target Audience of Prenuptial Agreements? The major target audience of prenuptial agreement sample is the married or to – be married couples. 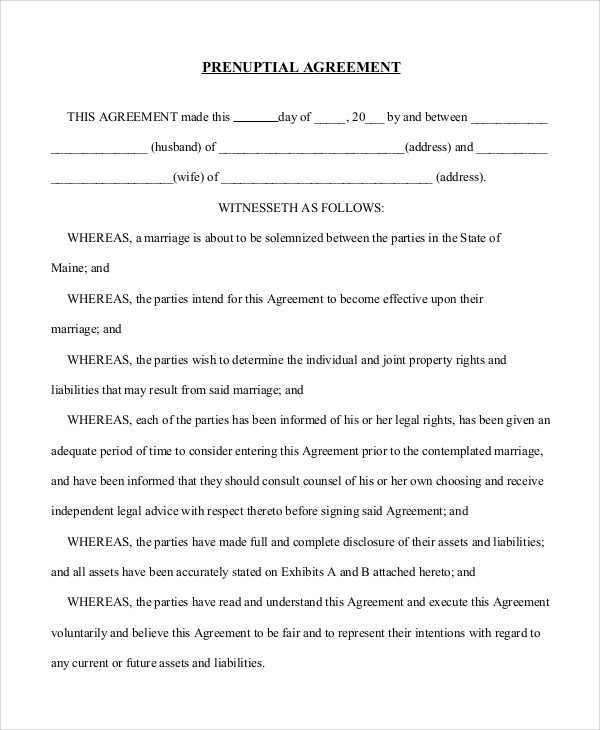 It is quite beneficial as a legal agreement for these couples. You can avoid the trouble of running back and forth to the court for a battle over assets and property after your marriage ends. They are helpful for clarifying the financial rights of the two. Since these agreements enlist various terms and conditions, they address a lot of serious issues like debts, the effect on children, tax issues, etc. 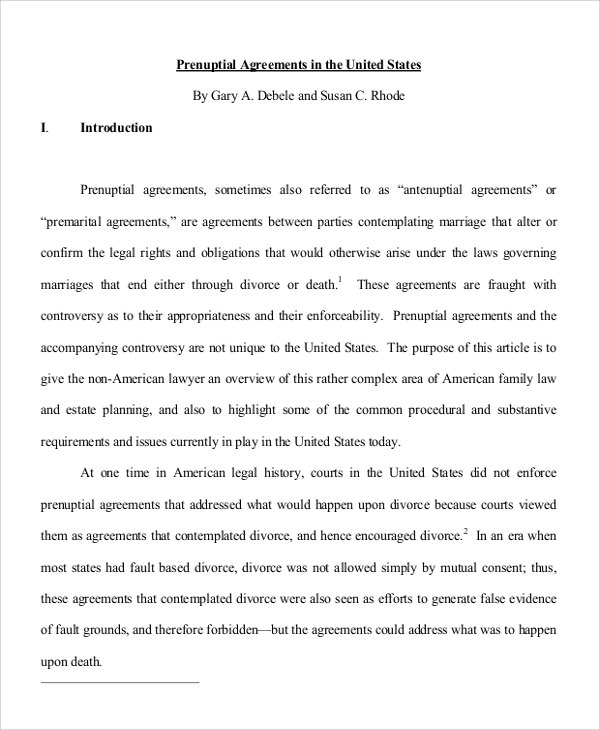 Free Prenuptial Agreement template available for free download is another benefit of this agreement. It helps the couples to lay down ground rules before their divorce. A prenuptial agreement sample is a legal contract which helps the husband and wife to enter into a Concord over resources for the future possibility of a divorce of counterpart’s death. Such agreements ensure a peaceful distribution of assets and property without the prospect of any legal cases. Franchise agreements are a similar type of legal agreement between a franchisor and franchisee.